Avante garde architectural, ostentatious art or an eyesore? Cool conversation piece, creative but cliche or downright kitsch? 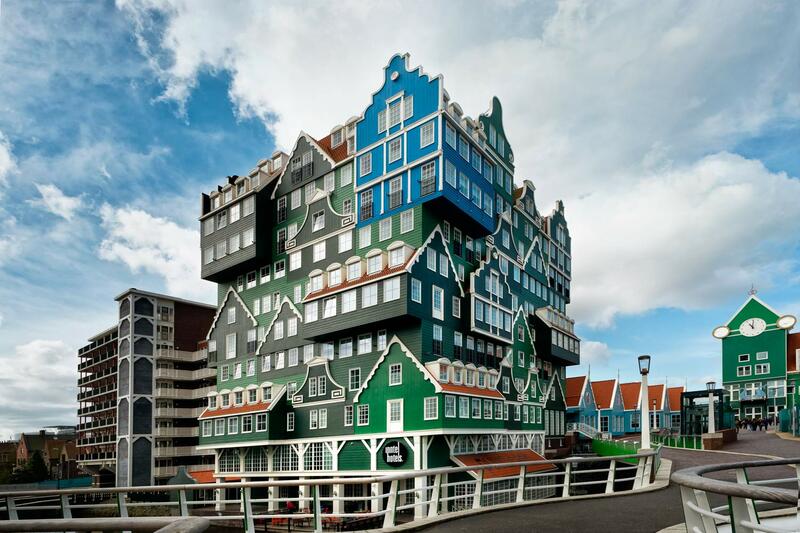 This new hotel in the Netherlands has sparked a great deal of conversation by using the traditional form of regional homes and cottages in a surrealistic stack (some even seeming to sit sideways or upside-down) as part of a relatively huge city-central structure. 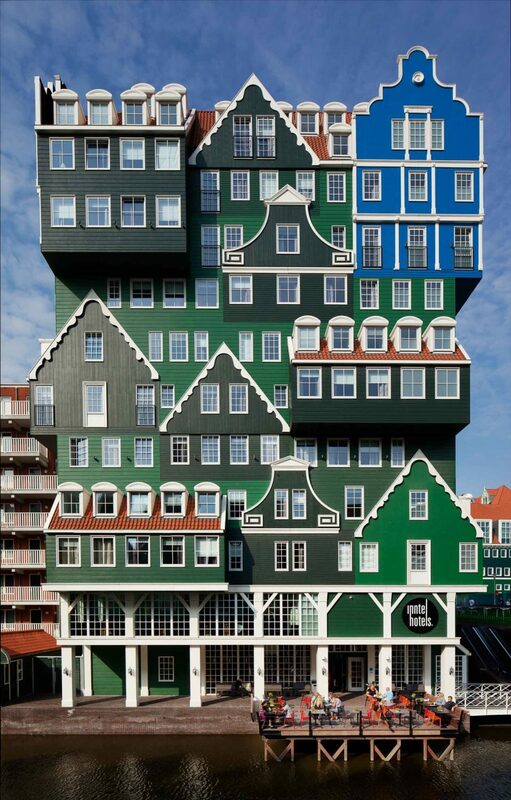 The Inntel Hotel (design by Molenaar & Van Winden Architecten + WAM Architecten, images by Roel Backaert) features 160 rooms and sits 11 stories high, towering over much of its surroundings and sticking out for miles around – for better or worse – from its urban landscape. 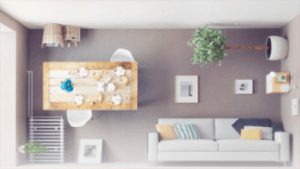 From their overall forms down to the white and green facades, wood-carved decor and window treatments, the component ‘houses’ in the design were patterned after actual conventional structures in the area. The construction involves timber framing and concrete-panel facades, which of course are concealed as part of the overall aesthetic strategy outside the boutique hotel areas. On the street level, the forms morph to become more modern and accommodate public pedestrian walkways, rail transit paths and other people-friendly elements more suited to contemporary city needs. Postmodernism in architecture was short-lived in most ways: packed with cliche historical references and kitsch appropriations of decorative traditions, most found that new references to old aesthetics lacked connection to our current age. Something about this building seems different, however, though only time will tell – and by calling it Fusion Architecture its creators are setting the stage to make it shift discussion away from the failures of earlier Postmodern architectural theories and designs. 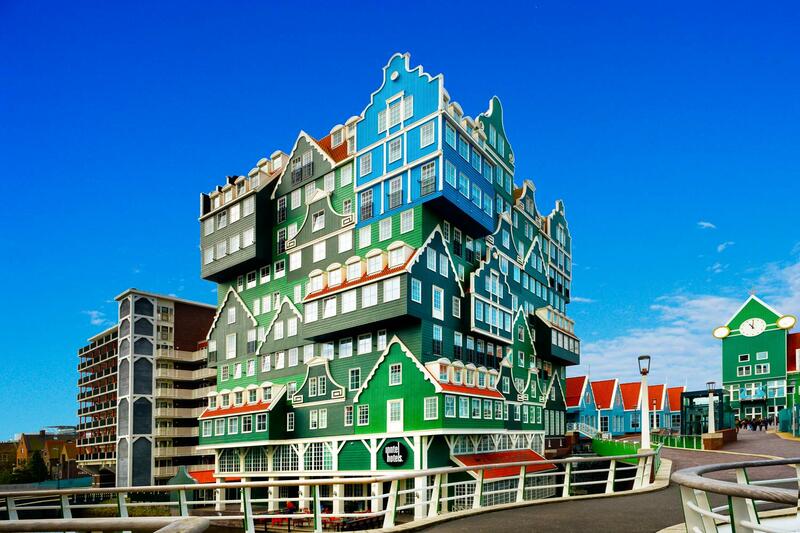 This fun bit of strange architecture may be one of the world’s weirdest hotels, at least in appearance, but it’s well suited to its Amsterdam setting and segues well into its surroundings. 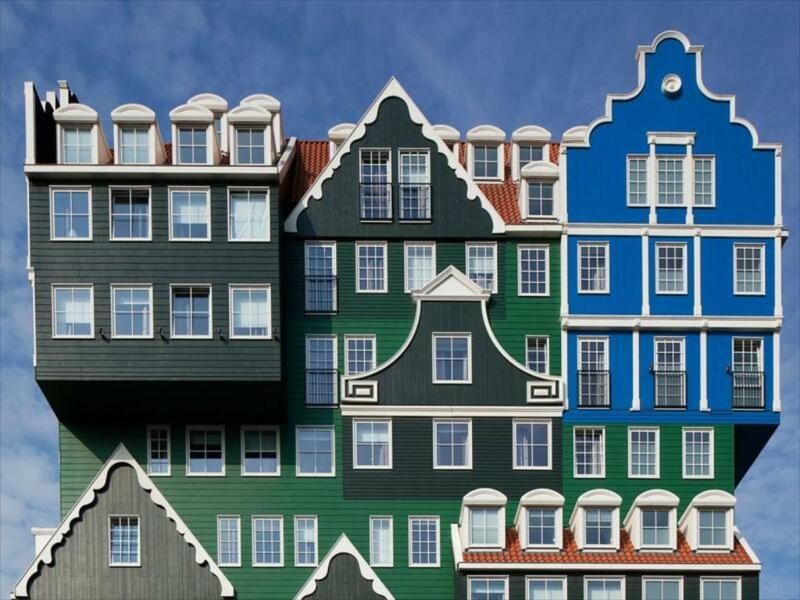 The Inntel Hotel offers a fun modernized twist on traditional Dutch vernacular style, and it’s carried out in a way that’s totally unexpected. Sure, it’s a bit of a monstrosity. But where else have you seen anything like it?